"A Masquerade of Surprises" is a Real Life Room Escape game by Escape House located in Varna Bulgaria in the center of the city. The room has two levels - normal and hard. Novice and regular players can enjoy the normal version as it has its challenges although the label. As players in the normal version of the game you will have to embrace your team work, deduction, logical thinking and puzzle solving skills, as you will find that the game is not that easy. 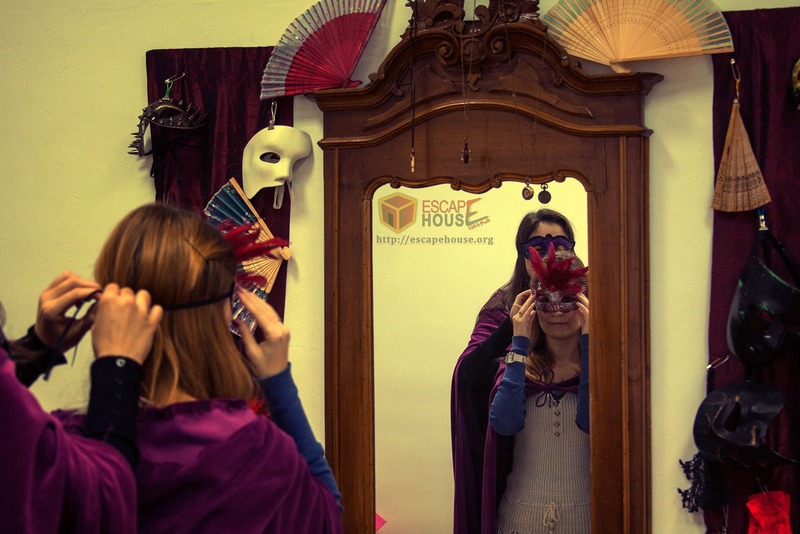 The atmosphere of the masquerade ball in Venice will pull you into its magic and will surprise you with its unexpected events. The place will definitely leave you with a lot of emotions and memories brought by the mystery and the magic of the different world behind the locked door of the room. The hard version of the game is targeted at more experienced players, who would like to put an extra effort to solve the puzzles with less hints and help. Players of the hard version will enjoy few extra quizzes and will have to try harder to find the actual objects that lead to their way out of the room. Escape House is not the only place for escape room games in Varna, but it is surely one that you will enjoy - find the key! © Escape House 2015-2016. Some rights reserved.